Who hasn’t heard if IKEA? We have all ordered something from its massive range of easy-to-assemble furniture items and loved every bit of it. 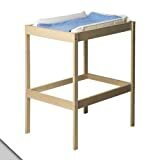 If you are a fan of IKEA, you ought to check out this diaper changing table from the baby furniture category. Length: 28 3/8 " Width: 20 7/8 " Height: 34 1/4 "
Diaper changing is a messy task, which requires cleaning up once the job is done. However, changing tables have revolutionized the world by allowing mothers to change diapers in a specified space without having to worry about the chaos that would otherwise be made while changing diapers for super-active babies. To view and compare tons of different changing table models, we’ve compiled a huge top list of the best changing tables. If you’re looking for something with a lot more features, the Healthy Kids Colors Deluxe changing table will have a lot to offer to you. Given that it’s made by IKEA, durability is a guaranteed feature. SNIGLAR changing table has been designed with the help of beech material, making it strong enough to hold a heavy baby. Thus, you can use this changing table for your first baby and for all those that are yet to come. With IKEA products, you can be sure to spend a good couple of years with only minor wear and tear every now and then. The changing table only weighs 25 pounds, making it portable around the house. You can keep it nearby wherever you are spending time with your baby. There is no need to go to the nursery every time your baby has a smelly diaper. You can choose to keep it close to the diaper changing supplies in order to keep the place tidy and uncluttered. Does not come equipped with a diaper changing pad. If you have tried IKEA’s furniture products before, this decision should not take long. It’s cheap, it’s durable, it does its job. The only real downside is the non-standard size of the changing table, allowing only for IKEA brand mattresses specifically made for the SNIGLAR to be used with it. Order away before stock runs low!